The Zodiac includes 12 different patterns. Each named after a sign of the Zodiac. Together the blocks will create a sampler quilt. To tie the blocks together, there is a "lattice" design that runs through all the blocks to make them more uniform in the overall design. 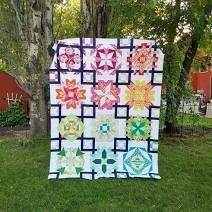 The Pointless Sisters are a 50 member art quilt group whose members’ quilts have been shown nationally and internationally. 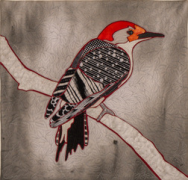 Using a variety of non-traditional quilting and surface design techniques, its members produce stunning and innovative fiber arts. It’s amazing to think that we’ve been here for over eight years! We’d like to thank ALL of you for your energy, enthusiasm and support! Broadway Quilts is a 2400 sq. ft. shop featuring over 2,400 bolts of the latest fabrics from Andover, Free Spirit, Moda, Art Gallery, Hoffman, Kaufman, Westminster, Michael Miller, Anna Griffin, Blend, Timeless Treasures …and more. I love getting new lines in the shop and am constantly striving to discover new books, patterns, classes, quilts, block of the month and gifts to keep you inspired. Our goal is to provide you with a wonderful selection of fabrics and a knowledgeable and friendly staff. We’ll bring our passion for quilting, fabrics and fun to share with you. Our favorite game is “find the fabric,” whether it is putting together an entire quilt—or finding that one, special fabric that will make your quilt pop. If you’ve been in the store you’ve probably seen us with 20 bolts of fabric out, stacked on the cutting table. It’s the best part of our day! What a perfect day….Grab a carload of friends and come to Sonoma. Enjoy the shop, have lunch and stroll around the historic Sonoma Plaza. Want to spend the day? Give us a call to be sure the classroom is free and we’d love to have you set up your mini group for a fun day of sewing. Make it your own special retreat! The use of the classroom is complementary. Be sure to sign up while you’re in the shop for our customer appreciation program. Purchase $140 of regularly priced bolt fabric and you receive a coupon for $10 off in the store. (The computer will track it for you—no card to carry) You may use your coupon for anything in the store. Tell us what you’d like to see in the store at info@broadwayquilts.com I get many of my best ideas from my customers—you’re always out there finding the hottest, coolest things. See you in the shop!